Congratulations to Kerryn Haarhoff for winning this awesome hamper! Mickey Mouse is celebrating his 90th birthday today! It was 90 years ago today, in November 1928, that Mickey made his first appearance in Steamboat Willie. What are birthday’s without presents, so one lucky reader will win this awesome Mickey Mouse hamper valued at over R600! 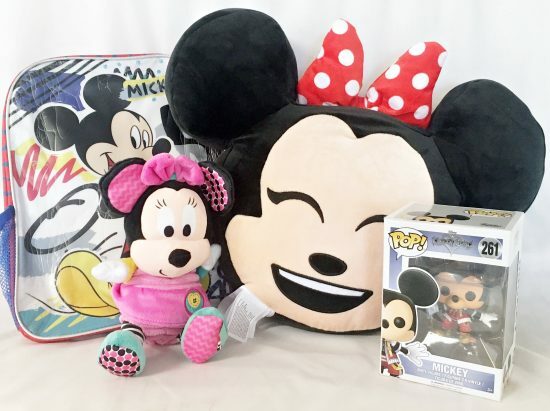 The hamper includes a Mickey Mouse Backpack, Disney Funko Pop, Mickey Mouse Emoji Plush Pillow and Disney Baby Activity Plush Toy. Get your entry in today by filling in the form below. To be eligible to win you must have liked the Forts and Fairies Facebook page and follow Forts and Fairies on Instagram. Only entries from South Africa will be eligible to win. One entry per person please. Competition closes on 9 December 2018. Terms and conditions apply. Thanks to Penguin Random House for sponsoring this awesome competition. Win a magical Christmas Elf & Reward Kit worth R495! Win an amazing Shampooheads hamper! Win Barbie Video Game Hero on DVD! To the next 90 Years of Mickey Magic!! Happy Birthday Mickey Mouse! Hope these years have been eventful and fun for you as it was for me. I enjoyed watching you as a child and now cherish those memories watching my daughter enjoy all your programs . Happy Birthday to a Legendary Disney Icon Mickey Mouse! Who has been our children’s entertainment throughout the years.. even mine! We wish you so many more amazing years to put laughter in our homes and smiles on the faces of our kids. Happy birthday Mickey we will always love you no matter how old we are. With the right keywords, you have access to high rankings in the google search results. be fully an attainable objective. Love this prize I have so much mickey memories from my childhood!